....well second day for me any way! 18th Birthday cards for identical twins! My son's request was to "make something the same but different" - big help sonny!! Gorgeous card Jane. You colouring looks ace and I love the PB images. Another lovely one Jane! I just love your colouring! I must be daft.. isn't your "one" turtle dove the same "partridge" I saw yesterday? Either way.. just loveliness! 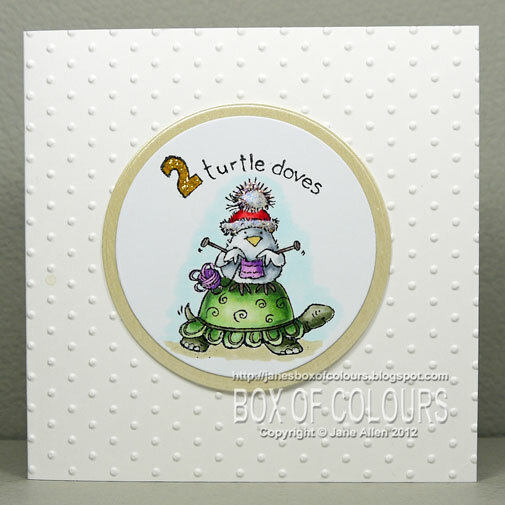 Dove on a turtle...ha ha. :-) I'm lovin' these PB images Jane. Thanks for the smile! Hugs!